A Joule Thomson valve also commonly known as a JT Valve is a flow control valve which capitalized on the 'Joule Thomson effect' to cool down a compressed gas by throttling its flow and causing rapid expansion. Joule Thomson effect suggests that rapid expansion of a real gas will cause it to rapidly cool down as well. Therefore JT valves are commonly used in the vapor compression refrigeration cycle. How does a JT Valve work? 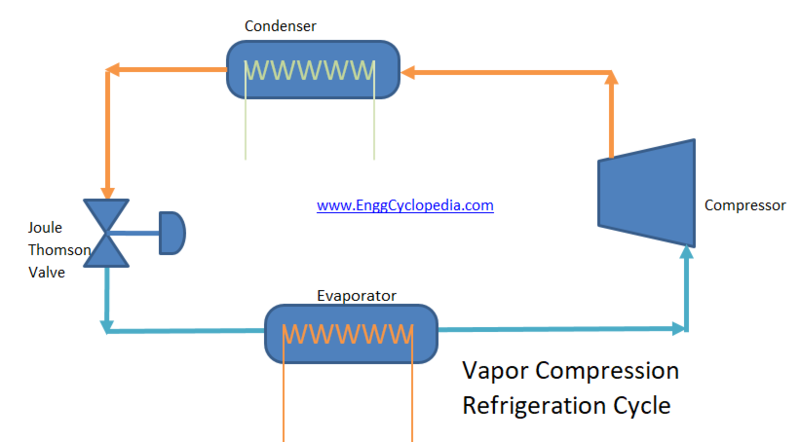 Vapor compression refrigeration cycle works in following steps. The compressed and condensed refrigerant is throttled through a JT valve for Joule Thomson effect. The cooled refrigerant gas is sent to a heat exchanger (or evaporator) where it can be used to cool down other fluids such as, air, water or other services. JT valves capitalize on the Joule Thomson effect to enable refrigeration. Hence they are used in all kinds of different scenarios involving refrigeration. Rapid expansion of compressed refrigerant is the main cooling force in household ACs and refrigerators. In natural gas production, some of the gas is throttle across a JT valve to cool it down and to remove some condensate elements at this stage. Rest of the gas is then sent to the gas pipeline. This minimizes the possibility of condensation, two phase flow and slugging in the gas pipeline.